As we move forward with the new system we will generating some interesting stats to measure performance. This is just the first example of what will eventually be a robust set of performance stats that will give us some unique visual representation of how the system is doing. 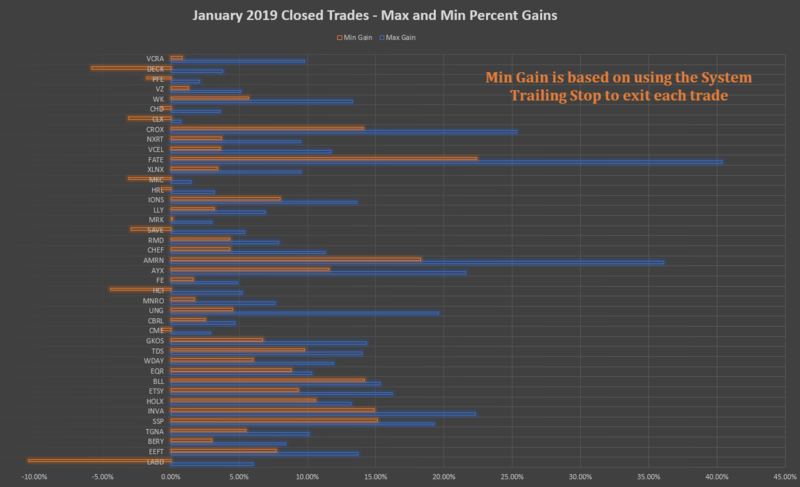 Here is a basic chart that shows all the trades that got Closed in January 2019 – with the Min and Max Percent gain / loss. The orange bars show us where the System Trailing Stop closed the trade and the blue bars show the maximum percent gain from the Trigger Price. Remember, our goal in swing trading is to have more winners than losers and for our winners to be bigger than the losers. Keep in mind this chart does not show where you might have sold a partial position at the Target, or where you might have closed some or all of the trade at a Parabolic Stop. It’s just meant to give a basic overall view of how the trades performed using nothing more than the Trailing Stop.